Rochester school board President Van White said at a board meeting Tuesday that he's seeking more time to respond to Distinguished Educator Jaime Aquino's report. The report, which gave a harsh assessment of the school board and district administration, included a lengthy list of recommendations for improving the district. State Education Commissioner MaryEllen Elia has made clear on multiple occasions that a plan that addresses the recommendations is due to her by February 8. Aquino was not optimistic about getting an extension. Concern about the plan has heightened after Regents Wade Norwood and T.Andrew Brown said at a recent public forum that legislative action may be needed to improve the district if the plan is sub-par. Senior administrators have been working on the plan for weeks with input from board members and Aquino. During Tuesday's meeting, several board members became increasingly alarmed about work to date on the plan and the roughly three weeks remaining to finish and submit a thorough response. The meeting, which went on for hours, was the third time board members, Aquino, and senior administrators met together regarding the plan. Some board members said the plan had a lot of generic statements and that it didn't answer questions they had during prior meetings. Board members Willa Powell, Cynthia Elliott, and Beatriz LeBron all said the plan lacked details. Without the "who, what, where, when, and why," Elliott said, the plan would be like many others the district has developed over the years: It probably wouldn't be implemented. And even if it was, it would be hard to monitor and evaluate, she said. A general lack of accountability throughout the district was one of Aquino's most pressing concerns. Aquino is a non-voting board member and he is supposed to provide guidance to school board members and district administrators as they prepare the plan. But some board members challenged Aquino during the meeting. Both White and Elliott asked Aquino if he would flag inadequate or wrong responses to his recommendations. And they wanted his assurance that he wouldn't let them present a plan to Elia that he thought she would reject. Aquino insisted that he has been helping board members and administrators. But board member Natalie Sheppard wasn't satisfied with Aquino's answer. As a school board member, she said, it's frustrating to be accused of micro-management and, at the same time, to be told that the board isn't holding the administration accountable. Sheppard also asked Aquino whether the recommendations in his report are truly recommendations or mandatory instructions. And she had concerns about how the plan would help the district improve. 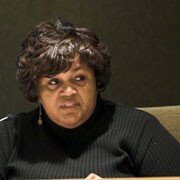 How can the board and administration come up with a clear plan when Superintendent Barbara Deane-Williams is leaving and a permanent superintendent hasn't been hired and hasn't seen the report, Sheppard asked. "This whole process has been a sham," Sheppard said. The school board has scheduled another meeting to discuss Aquino's report and the district's improvement plan on Thursday, January 17, at the district's central office, 131 West Broad Street, at 4:30 p.m.